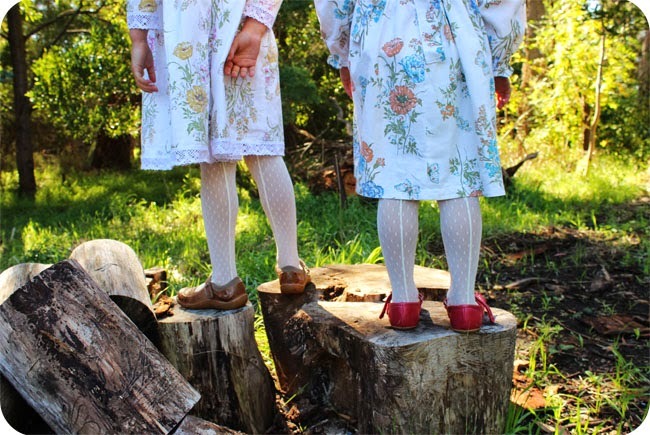 Today I am guest posting for Vintage May hosted by Kristin from Skirt as top and Jess from Craftiness is not optional. This is the third year the series has run and it celebrates all things vintage in sewing. I love vintage...fabrics, patterns and styles. 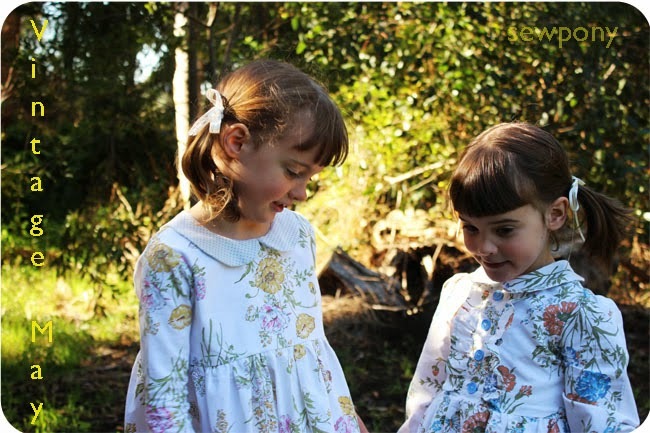 My little etsy shop - sewpony Vintage, currently stocks two vintage inspired sewing patterns for girls. I am also working on a vintage bathers pattern which I hope to complete in the next month or so. Actually Vintage May was when I first sewed up the prototypes for my Debbie's birthday dress sewing pattern. Yay for vintage! So I was very excited to be invited by Kristin and Jess to take part in this series. 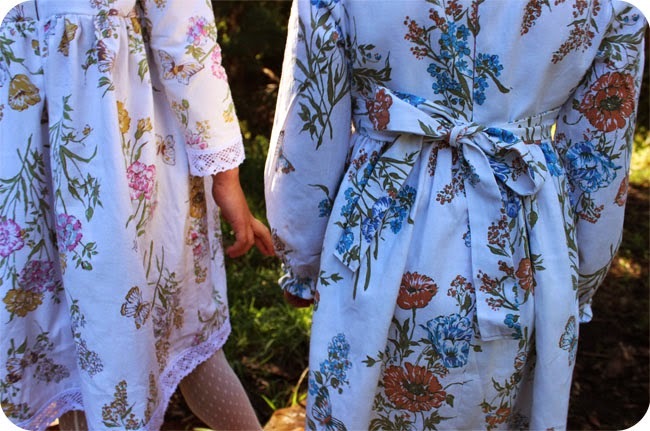 I knew I wanted to make something from my late Grandma's floral sheets. I had them in my stash for a while waiting for a special project. 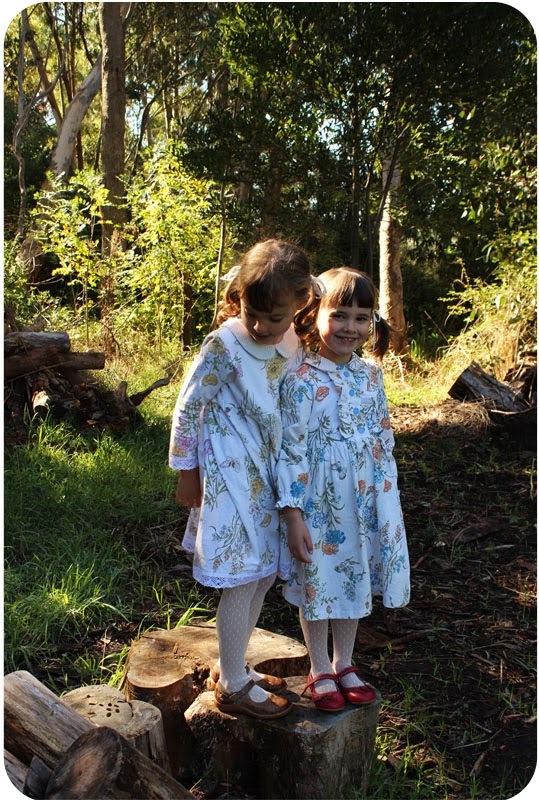 The girls wore these dresses to my Grandpa's funeral last week and my Aunties, Uncles and cousins all recognised the fabric right away and it was a lovely touch to the day wearing these dresses that brought back so many memories. 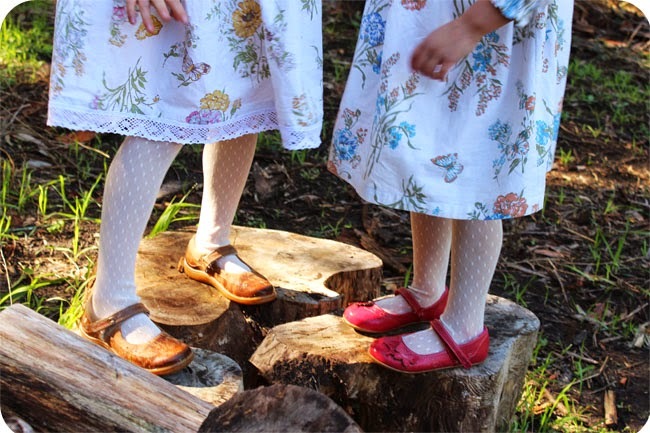 The girls were given these sweet spotted stockings a couple of years ago and had never worn them. They look pretty sweet paired with these dresses. Juliette's dress is from a vintage pattern from the 1970's (unfortunately I could not find the cover to photograph this week). It has an eton collar, a frilled button tab, high waist and gathered long sleeves. The back closes with an invisible zip and tie. 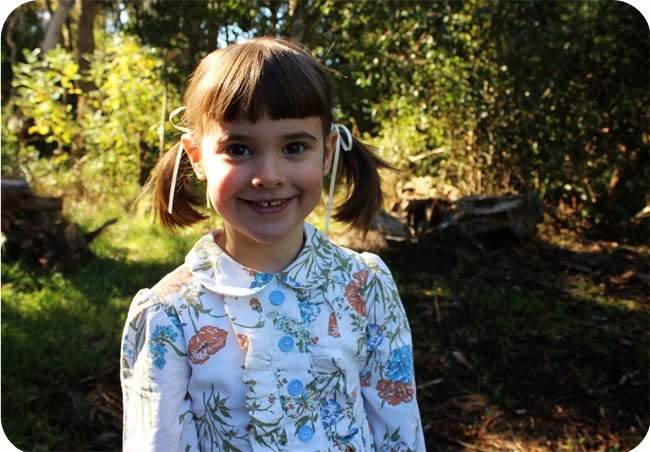 Issie's dress is self drafted. I used the bodice part of my Debbie's Birthday dress pattern and made up the rest. The lace on the sleeves and hem were given to me by my lovely friend Rachel from Stitched Together. 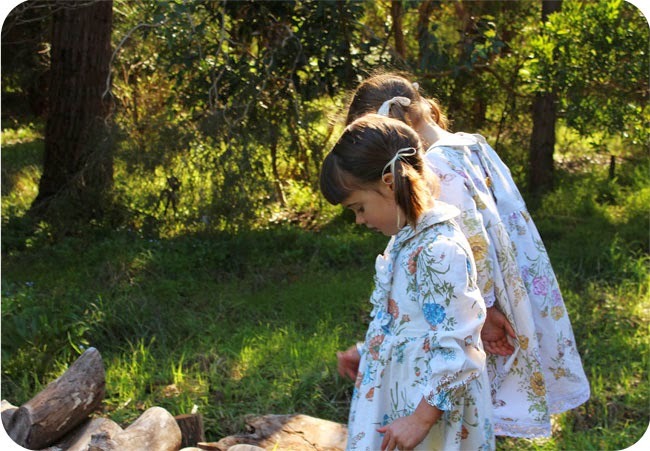 The girls look a bit like they are from Little House on the Prairie in these dresses on our property. To celebrate Vintage May, I am having a 15% discount on my two vintage style patterns in my sewpony Vintage etsy shop for the duration of Vintage May (until next Friday). Just use the code: VINTAGEMAY14. Thanks so much for having me Kristin and Jess!! I hope you like what I made. These dresses will always be special in our family. 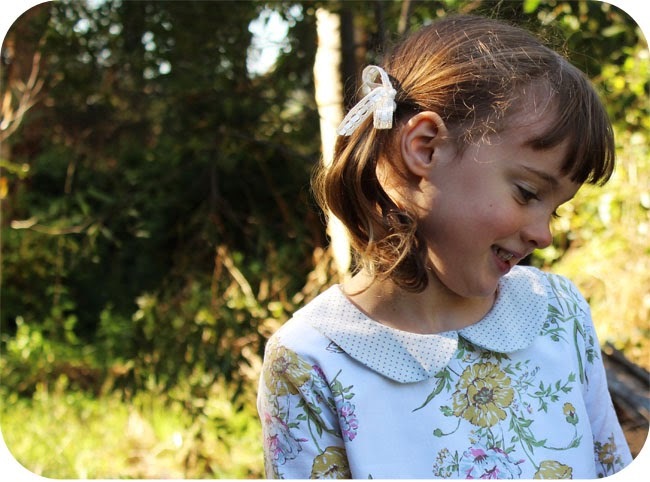 Make sure to have a look at Jess and Krisin's blogs to see more vintage sewing inspiration! It IS very Little House...I would have loved that as a little girl. To be all dressed up and pretend. :) Love it!!! SOO so sweet! I love the meaning behind the fabrics and that your family recognized them! Amazing! They look so cute in their new special dresses! thanks again! That is SO sweet! And even though the occasion was sad, it is still such a sweet story. I LOVE what you did! And your girls looks ADORABLE. Oh, these are so so cute! The dresses are cute as special indeed. I bet your family enjoyed seeing the girls wearing such special outfits, even though the occasion was sad. Awesome looks. Their happiness shows comfortable.